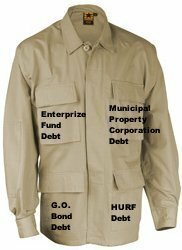 The major categories of debt that Glendale carries have been identified in the previous 4 blogs. How the revenues are spent has also been explored. The next question is…was the issuance of all Glendale debt prudent and necessary? The issuance of Enterprise Fund debt, Highway User Revenue Fund (HURF) debt and Transportation debt has historically been reasonable and prudent. The debt associated with these three funds are for the “bricks and mortar” of the city. They fund projects for the construction of new infrastructure as Glendale grew and for the repair and maintenance of all city infrastructures. They were used on projects as diverse as new water treatment facilities to new traffic lights to Northern Parkway. There is one form of debt that I have not covered previously and that is the Interfund Loan debt. The General Fund borrowed from the Water/Sewer, Landfill, Sanitation, Technology Replacement and Vehicle Replacement Funds to cover two annual $25 million management fee payments to the National Hockey League (NHL) for Jobing.com Arena during Fiscal Years 2011 and 2012. The first $25 million annual fee payment in 2011 came from the General Fund’s Contingency Fund and no Enterprise Funds were used. The second $25 million annual fee payment in 2012 came from loans from the above mentioned funds with the lion’s share of $20 million borrowed from the Water/Sewer Enterprise Fund. We know from Ordinance 1451 that, “The sanitation fund shall be a separate and protected fund, to be used for no other purpose than expenses associated with sanitation services.” The other Enterprise Fund Ordinances carry the same caveat. The debt issuance decisions associated with the General Obligation (G.O.) bonds and the Municipal Property Corporation (MPC) bonds have not always been prudent or even necessary. As has been stated previously some of the council decisions were political. In the G.O. bond category just two examples are: the accelerated advancement of the Foothills Recreation & Aquatic Center which was politically motivated; as was the Capital Improvement Program (CIP) number 1 placement of the Public Safety & Training Facility (PSTF). The PSTF was funded with a combination of G.O. debt and MPC debt. Was the need for either of these facilities critical? No. Those that get everything in north Glendale wanted more and in this case it was their own recreation and aquatic center so that they wouldn’t have to travel down “there.” The number of resident-owned swimming pools in north Glendale and especially the Cholla district is astronomical compared to any other region of Glendale. It’s ironic that this facility has become regional serving the interests of Peoria and Phoenix residents. Councilmember Martinez would be quick to point out that the facility earned revenues that just about cover the annual O&M facility costs but those revenues do not cover the debt issued to pay for its construction. That’s being paid off by every property owner in Glendale with their secondary property tax. Was the need for a Public Safety Training Facility (PSTF) critical? Again, the answer is No. To this day new police recruits go to a regional police academy such as the Arizona Law Enforcement Training Academy (ALETA) for initial training. The PSTF is used by Glendale police for advanced training only, another function whose needs can be met elsewhere. The Glendale fire department just had to have this facility even though they have always been able to obtain training slots for new recruits at the regional facilities in Phoenix and Mesa. Training slots had never been an issue. Suddenly the dearth of slots became the rationale for Glendale’s very own training facility. Lastly we arrive at the MPC Bond debt. Were the projects funded by MPC debt critical and necessary? The answer is No. Decisions regarding MPC expenditures were often political. Former Mayor Scruggs always went ballistic when she heard references to Glendale as the town of “hicks and sticks, plows and cows.” She and former City Manager Ed Beasley shared a vision. Their vision was that Glendale would become an equal of the well known Valley cities who had developed a niche and a city brand for themselves. Tempe is known as a college town. Scottsdale has always been the “west’s most western town.” Chandler and Gilbert were becoming the technology towns. Glendale wanted to be the sports town. The former mayor often had majority council support from Councilmembers Eggleston, Martinez, Frate and Goulet. All wanted Glendale to be a member of the “big boys’ club” that included cities like Phoenix, Scottsdale and Tempe. All had cache and Glendale had none. The road to acceptance meant Glendale’s branding as a sports and entertainment mecca and accepting the cost associated with making that a reality. As major developments appeared and wanted costly incentives to locate in and around the Westgate area, more and more MPC debt was issued. Glendale has issued more MPC debt than it can sustain for such projects as Jobing.com Arena, Camelback Ranch, the Regional Public Safety Training Facility, Zanjero infrastructure and the Westgate parking garage, media center & convention center. All…very “big ticket” projects. These projects are the albatrosses hanging from Glendale’s neck. The final blog in this series will explore any possible solutions to paying down or eliminating the MPC debt. Can it be done? Yes but it requires the will to do so.